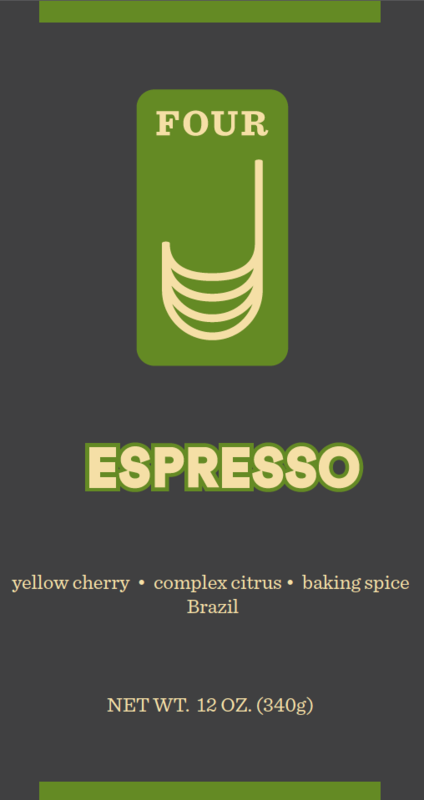 Created by the Four J Chefs, this single origin espresso is sourced from the sweet coffees from Fazenda Ambiental Forteleza (Environmental Farm Fortress) in Sao Paulo, Brazil. More than a century old, this female-owned farm uses sustainable agriculture and organic practices in its coffee production. This talented family of coffee producers selected this harvest of ripe yellow beans and employed a natural processing method on raised beds to dry the beans. Their care for the environment extends beyond the beans. The FAF works to protect and maintain the natural habitat of the Bob-0-link, a unique black and white bird that migrates to South American from North America every year. Our distinct roast profile selection for this coffee is the unique factor that causes the rare, sweet balance. With careful preparation as a doppio espresso or creamy cappuccino we are certain you will taste the results in the cup we’ve come to enjoy. This coffee is also outstanding as a drip brew.